The Romanza is the perfect choice for those wishing to get away from it all and enjoy a friendly hotel with stunning views. Located at the top of the village, overlooking the bay of San Stefanos in its own pretty gardens, the Romanza attracts many repeat guests. the romanza is a very nice place to stay lovely views with a sunset but be prepared for a hill on your way back from the village. our rep cris was excellent,we would like to return soon. 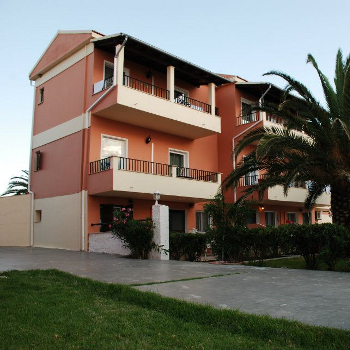 It was our first visit to San Stefanos and the Romanza and we would definitely return. The views from the hotel balconies are outstanding and the sunsets breathtakingly beautiful. The path leading from the hotel is very steep but for anyone fairly fit should not pose too much of a problem and there you can always walk down the road if you prefer. The accommodation was basic as we expected but clean as was the pool area. Breakfast also was pretty basic but OK with the option to purchase an English breakfast for 2.50 euros. There was a decent menu too at the hotel restaurant and we ate there about 4 nights and a couple of lunchtimes. The staff without exception were really friendly and helpful - can't speak to highly about them. Can't wait to go back. This was our first stay at the Romanza but it won't be the last. The rooms were cleaned daily and the food served in the hotel was excellent. We paid the extra for the air conditioning as it was too hot without, but this helped keep any mosquitoes away. The pool area was very clean and the view from the hotel is beautiful, with sunsets every night. The only slight drawback is the hill to/from the resort centre, which can be a pull in the sunshine or after a night on the town. A quad bike is the answer! The staff at the hotel are brilliant and looked after us for the 2 weeks. As you can tell from our ratings, we cannot recommend The Romanza any more highly. We had a truly wonderful holiday on Corfu, mainly due to the outstanding service, food and location of The Romanza. On arrival (at midnight), we were shown to our room and then made our way to the bar, which was still fairly busy although not manic. Even this late at night, it was still ok to arrange air con (5 euro per day) and safe (5 euro per week). Our room was clean and functional and was kept clean throughout our stay. The following morning, we were totally amazed by the view from our room - over looking the beach and bay of San Stefanos. As far as we could see, all rooms had a good view. Just over our balcony was a path down to the beach. It was quite steep but alot quicker than going by the road (which is a proper trek). Food lovers will be in heaven at The Romanza. A basic breakfast was included (toast, cereal, eggs, pastries etc) in our room rate but for an extra 2.50 euro, you could order an english breakfast, yoghurt & honey or veggie breakfast (all well cooked/presented). Lunch ranged from snacks (toasties, burgers & bagettes) to massive greek salads and souvlaki. And dinner was just an endless amount of choice, all well cooked. tasty and very good value. The pool over looks the cliffs and bay (like the rooms) and had a very relaxed feel and never overcrowded. There is no music blarring out, so it's an ideal spot to chill out with a good book and a cold beer. The lovely thing about The Romanza is that evrything goes at your individual speed. In the evening, there are quiz nights and greek night to join in with, if you want but if not, it's not a problem. And the main selling point of this gorgeous hotel is the people - Everyone working there does their utmost to make you feel welcome and well looked after. From help with the greek language to directions and much much more, there is always someone about who can help you. If we had the dosh, we'd squeeze another holiday before the end of the season!!! The Romanza appealed to us because of its location overlooking the Diapontia islands of Othonos, Ericoussa and Mathraki and the fact that we would get a sunset. It was also appealing since it has a pool and easy beach access. We were the last drop-off on the airport coach but it was well worth the wait. The friendly helpful reception staff Christina and Tracey were there to take us to our rooms, and explain about breakfast and the restaurant, doing a good bit of up selling by suggesting that if we wanted a snack after our journey the restaurant would close in half an hour! This was great information allowing us to sample their delicious cuisine and get a good look at the menu to help our choice later in our holiday. The restaurant was open air with a sun canopy overlooking the islands and beach. The perfect start to our holiday. They served a good choice of non-alcoholic and alcoholic beverages and tea (made with PG Tips!!) and coffee. Romanza is situated up a fairly steep hill it takes 10 minutes to get down to the resort centre, you pass 2 other hotels on the way down - and on the return trip can call in at both of these for a welcome drink! (more on that in resort review). The rooms at the Romanza were simple but spotless with nicely matching furnishings and plenty of clothing storage and drawers. The bathroom was typically Greek style with shower but boasted a shower curtain and a shower wall fixing which enabled a proper shower to be taken- it provided continuous hot water all of the day. We had a balcony overlooking the islands and Albania in the distance, from which we got a fabulous sunset every day! and after nightfall watched the stars- looking out for shooting stars - we did see several and made wishes!! Each day the room was cleaned and bins emptied and our linen was changed 3x during the week. The windows had useful mosquito netting as it was very hot while we were there and this enabled them to be left open, mosquito's were a bit of a problem - however I think numbers of them were kept down at Romanza by the house martins swooping and feasting on them every evening! As I have said the food and service here was outstanding - friendly and nothing was too much trouble. Breakfast was taken on the terrace and a choice of eggs & toast , croissant or cereal could be made included in the room rate - or additional cooked meals could be had for a few euros. There is easy access to the beautiful clean golden beach from the hotel garden down a steep-ish track which was easily managed.